, a comic writer of ancient Rome, was born at Sarsina, a small town in Umbria, a province of Italy; his proper name was Marcus Accius he is supposed to have acquired the surname of Plautus, from having broad and ill-formed feet. His parentage seems to have been mean; and some have thought him the son of a slave. Few circumstances of his life are known; Cicero has told us in general that he was some years younger than Naevius or Ennius, and that he died the first year of the elder Cato’s censorship, when Claudius Pulcher and Lucius Portius Licinius were consuls. This was about the year of Rome 569, when Terence was about nine years old, and 184 years B. C. A. Gellius says, that | Plautus was distinguished at the same time for his poetry uptm the theatre, that Cato was for his eloquence in the forum and observes elsewhere, from Varro, that he was so well paid for his plays, as to think of doubling his stock by trading in which, however, he was so unfortunate, that he lost all he had got by the Muses, and for his subsistence was reduced, in the time of a general famine, to work at the mill. How long he continued in this distress, is uncertain; but Varro adds, that the poet’s wit was his best support, and that he composed three plays during this daily drudgery. 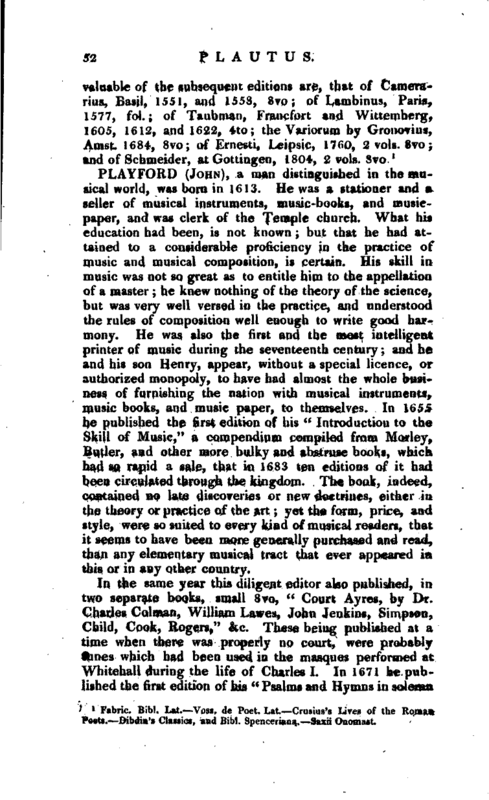 It is doubtful how many plays he composed. We have only twenty extant, and not all entire. Varro allowed twenty- six to be of his composition, which were all extant in Gellius’s time. Some made the number of his plays to exceed an hundred but this might arise from his revising the plays of other poets, which Gellius supposes he did and Varro' s account ought to be decisive. This learned Roman had written a particular treatise on Plautus’s works, from the second book of which, quoted by Gellius, the preceding particulars are taken. 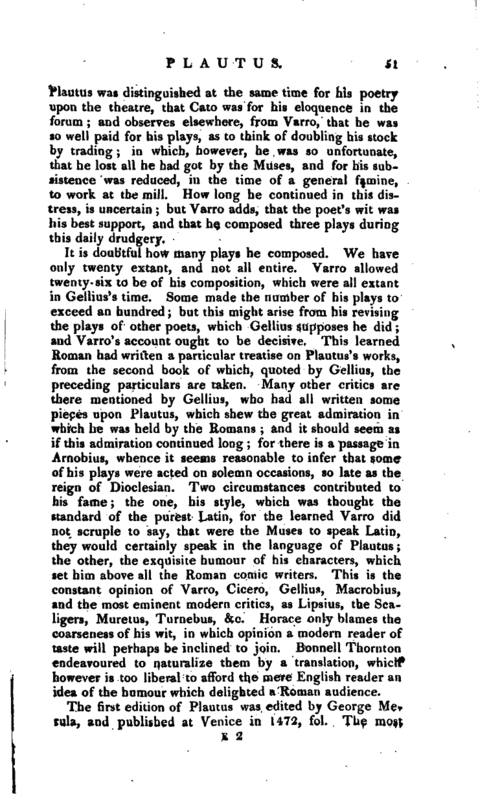 Many other critics are there mentioned by GelHus, who had all written some pieces upon Plautus, which shew the great admiration in which he was held by the Romans and it should seem as if this admiration continued long for there is a passage in Arnobius, whence it seems reasonable to infer that some of his plays were acted on solemn occasions, so late as the reign of Dioclesian. 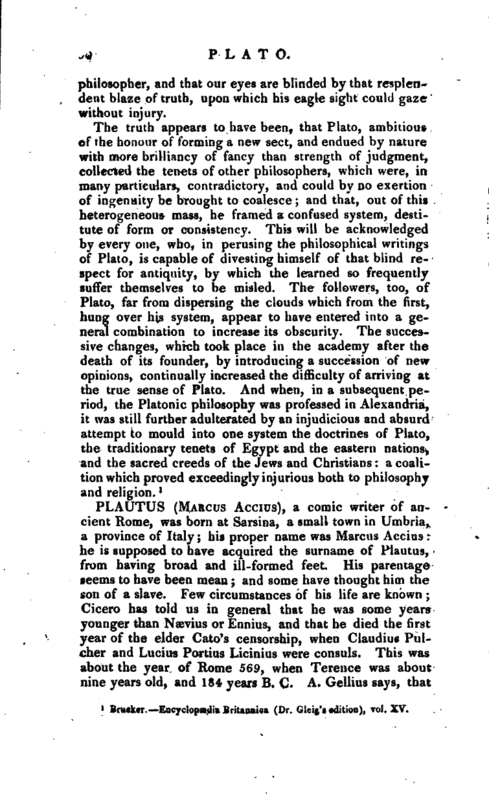 Two circumstances contributed to his fame; the one, his style, which was thought the standard of the purest Latin, for the learned Varro did not scruple to say, that were the Muses to speak Latin, they would certainly speak in the language of Plautus; the other, the exquisite humour of his characters, which set him above all the Roman comic writers. This is the constant opinion of Varro, Cicero, Gellius, Macrobius, and the most eminent modern critics, as Lipsius, the Scaligers, Muretus, Turnebus, &c. Horace only blames the coarseness of his wit, in which opinion a modern reader of taste will perhaps be inclined to join. Bonnell Thornton endeavoured to naturalize them by a translation, which however is too liberal to afford the mere English reader an idea of the humour which delighted a Roman audience. Fabric. Bibl. Lat. Voss. de Poet. Lat. Crusius’s Lives of the Roman "Poets. Dibdin’s Classics, and Bibl. Spenceriana. —Saxii Onomast.